Pre-heat the oven to 180°C/350°F. Roughly slice celery root and grate it into a bowl, together with the pears. Dice bacon. Add nutmeg and dried thyme and season with salt. Add bacon and mix thoroughly. Grease a baking dish with some butter. Add the mixture of celery root, pears, and bacon to the baking dish. Pour vegetable stock evenly over it. 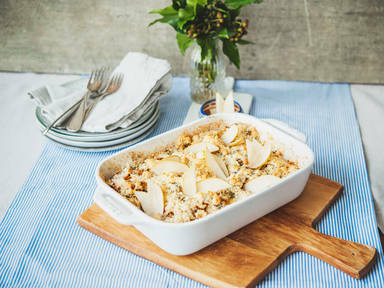 Crumble blue cheese and distribute crumbled blue cheese, butter, and ground almonds over the celery root-pear mixture. Bake at 180°C/350°F for approx. 35 – 40 min., increasing the temperature to 200°C/400°F for the last 10 min. Garnish with pear slices and enjoy!